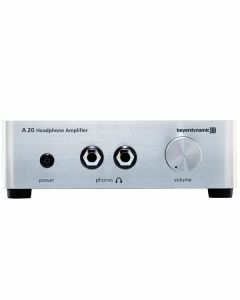 A headphone amplifier for demanding music lovers - It is the perfect choice for all music lovers who want to get the best out of their headphones in the living area or at the computer. Rediscover your headphones with the A 20. With a high-gain RCA input, the A 20 works easily with most sources. The input signal can be looped through and is entirely free from signal loss thanks to the hard-wired RCA output. The A 20 guarantees an especially open and transparent sound with any headphones, no matter if having a low or a high impedance. Also in terms of flexibility, the A 20 leaves nothing to be desired: the knob made of solid aluminium is equipped with an original ALPS potentiometer for variable volume control. On top of that, the A 20 features dual headphone jacks on the front. The user can thus freely choose to share their music with somebody else. With its housing made of brushed aluminium, the A 20 is not only especially resonance-free but also displays an attractive appearance. Without any visible screws or seams on the housing, it appears to be made of just one piece.